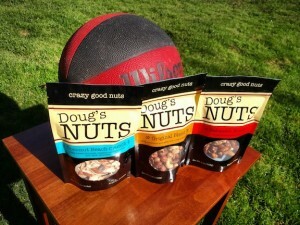 Doug’s Nuts For March Madness! Doug’s whole household is crazy about the NCAA Men’s Basketball Tournament, affectionately known as March Madness. That’s why we’re offering a special deal on case orders from now through April Fool’s Day. All you have to do is order a case of Doug’s Nuts (and you can choose from Original Blend, Habanero Honey, Coconut Beach Crunch or the Sampler Case with 8 bags of each blend) from the website and enter the coupon code MAD4NUTS. Within days you’ll receive your very own stash of the most delicious snack nuts on the planet and you can either share with friends or just plop them on the couch next to you as you watch the games unfold. There’s method in our madness, eh?